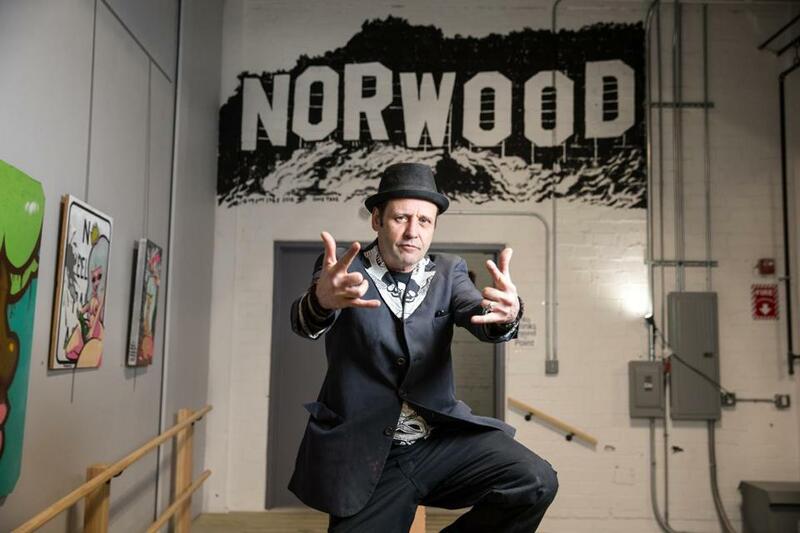 Artist and musician Dave Tree in front of a mural he painted at the brewery at the Norwood Space Center, at Bird Corporation’s former headquarters. But a short drive off the Automile, behind a nondescript self-storage facility in a cluster of factory buildings that have stood mostly vacant for years, an influx of painters, interior designers, photographers, and other creative types is giving people another reason to come on down to Norwood. They’re bringing this quintessential suburb its own cultural hub. The allure of the new Norwood Space Center, built on an old industrial campus, is implied in its name: Space. Vast warehouses full of it. Now the once-sleepy site is being filled mostly by tenants in creative fields — they’re officially known as “members,” in keeping with the bohemian vibe — who have been eager to customize their raw boxes of space. “Our game is adaptive reuse,” says DePree, who has lived on the South Shore for decades. The project was inspired, in part, by his own desire for access to culture and things to do that didn’t require a drive into Boston. The campus comprises 12 buildings, totaling 300,000 square feet, or more than six football fields. For as long as Norwoodites can remember, it was headquarters for the Bird Corporation, a historic family business that was founded as a paper mill and more recently manufactured shingles and vinyl siding. Bird went out of business just after marking its 200th anniversary, in the late 1990s. 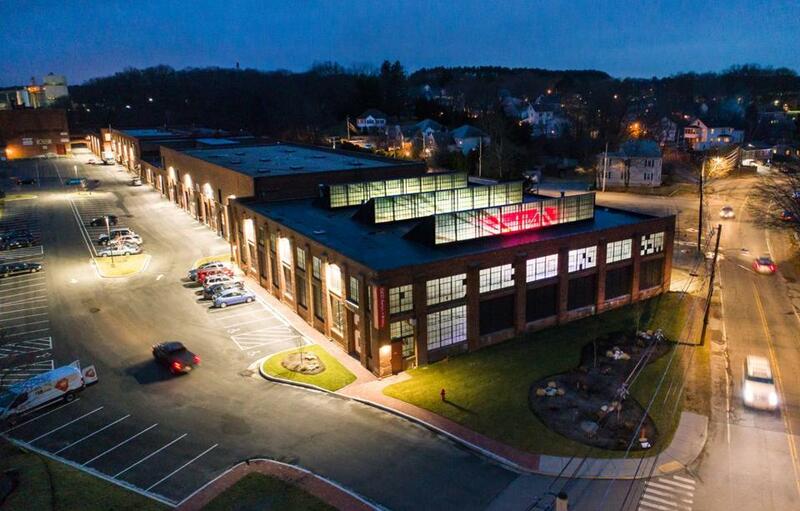 The former headquarters of the Bird Corporation have been transformed into the Norwood Space Center, which comprises 12 buildings totaling 300,000 square feet. Each workspace is different. There are 300-square-foot studios with plywood walls and open-air ceilings, walk-in storefronts with garage doors that open onto a central parking lot, and a former factory stockroom. The smallest spaces rent for as little as $500 a month, offering a more affordable alternative to Boston real estate prices. When DePree and his partners took over the defunct facility, the idea was to offer workspace to entrepreneurs at various levels of commitment, from month-to-month arrangements to 20-year leases. Any business is welcome — not just self-owned or creative ones — although those types have been especially interested in the space. The developers have been working their way through the renovations, building by building; after the latest was completed in January, it opened at full capacity. Adjacent to the standalone storage facility is a wide-open warehouse space that stands at the gateway to the L-shaped Space Center complex. A huge empty room outfitted with a Bose PA system and a digital mixing board, it’s ready to be rented for live music, indoor festivals, and other events. So far, the developers have tested the waters with a handful of gatherings, including a periodic art fair and vintage flea called the Curio Market. Last spring, the Space Center hosted an open house in conjunction with ArtWeek Boston, with performances by Norwood’s School of Rock and a panel discussion on Fred Holland Day, an eccentric Norwood publisher who was an early advocate for photography as an art form. In October, Boston music veteran Chuck White (who started the virtual Boston Rock and Roll Museum) brought his road odyssey, the Route 1 Project, to the Space Center. The extravaganza included bands, food trucks, and artifacts on display from Rick Kosow’s Sneaker Museum and David Bieber’s massive rock ‘n’ roll collection. 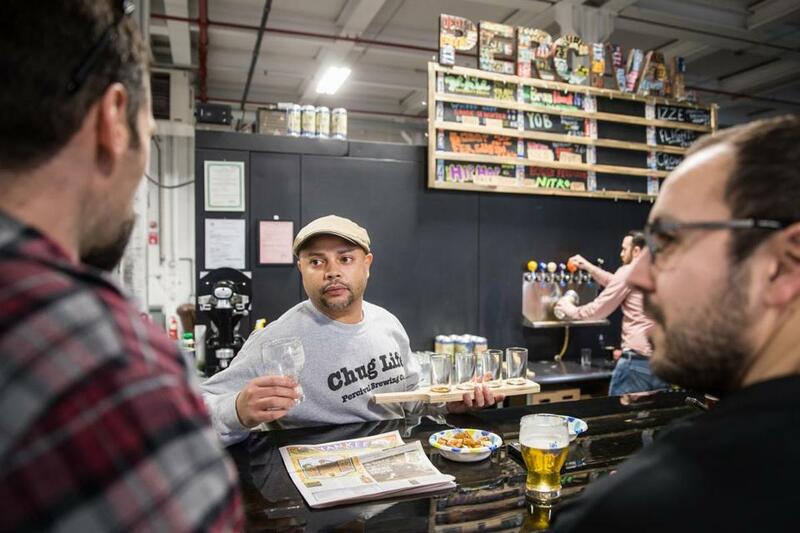 Owner Felipe Oliveira serves customers at Percival Brewing Company. One of the Space Center’s first permanent tenants was Percival Brewing Company, a craft brewer founded in Dorchester. Its owners opened a taproom in Norwood last fall and have since expanded into the coffee roasting business. They also showcase a rotating gallery featuring regional artists. Another anchor is the David Bieber Archives, the memorabilia collection of the former creative services director for WBCN, WFNX, and the Boston Phoenix. Though Bieber’s huge collection is not currently open to the public, he envisions a “retrievable resource” of rock ‘n’ roll, sort of like a research library for scholars of pop culture. Bieber’s archive includes an estimated 40,000 vinyl albums and thousands of soundboard tapes and videocassettes, as well as promotional items, posters, complete runs of counterculture newspapers, and much more. Though some choice items from Bieber’s lifelong obsession form a rock ‘n’ roll museum of sorts at The Verb Hotel in Boston, for years all but a fraction of his collection sat untouched and unsorted, covered in shrink-wrap on more than 200 pallets in a warehouse in Avon. More than a dozen tractor-trailers were filled during the relocation. 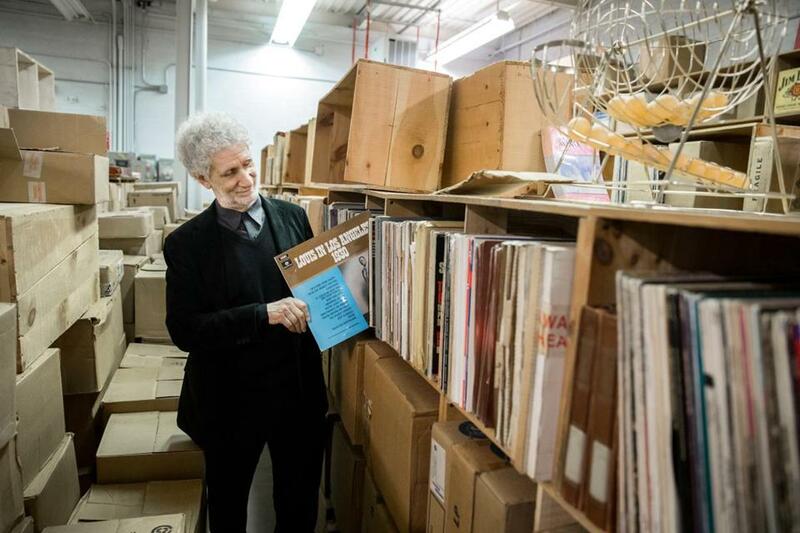 David Bieber with his rock ‘n’ roll memorabilia collection. Eventually, he expects to curate an exhibition for Space Center visitors like the one in the lobby at The Verb. For fellow tenants, the endless adaptability of the space makes for a lively work environment. The buildings themselves have a certain heavy metal chic. 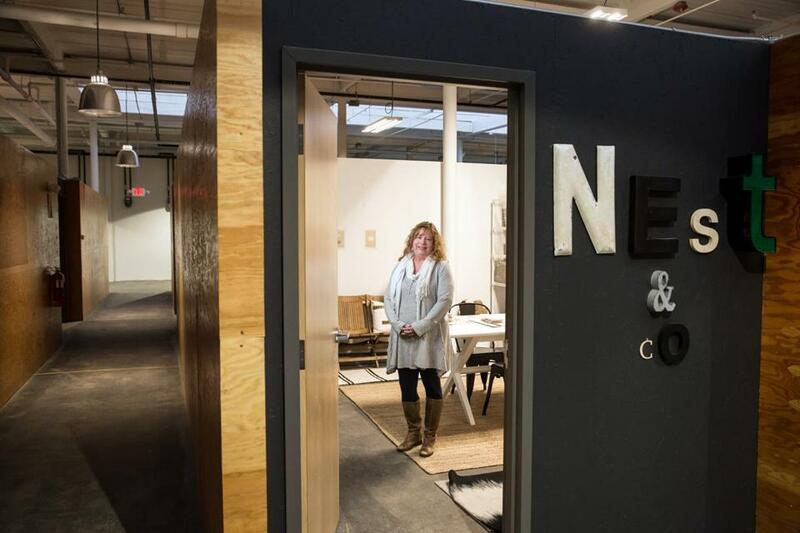 Tenant Tracy Parkinson, who grew up in Norwood, had an office for years in a loft building in Boston for Nest + Company, her interior design business. “I didn’t think I could find a space like that in the suburbs,” she says. She was tired of commuting, but didn’t know where else to go. She’d drive by the old Bird campus in her hometown and think it was a shame that the place had gone dark. When Parkinson learned that units in Building 6 were available, she snapped one up. Now she works in a studio office, with painters and other artists as next-door neighbors. She loves the time-tested features of the complex — loading docks, spiral staircases, exposed brick and stone. Thus far, happenings at the Space Center have been modest. Percival Brewing Company runs a Thursday night comedy series called Foolery at the Brewery. In late February, local artist and musician Dave Tree hosted a group art show featuring a dub reggae dance party. Drinking a Pabst Blue Ribbon in the bowels of the Bieber archives on a recent Friday afternoon, Tree enthuses about the prospects for the Space Center. It’s not Hollywood, but it’s not quite your father’s Norwood, either. “I was born to bring culture to the suburbs,” he says. Interior designer Tracy Parkinson moved her Nest + Company office space from a loft building in Boston to the Norwood Space Center. A DJ plays music in the pavilion at the Norwood Space Center. 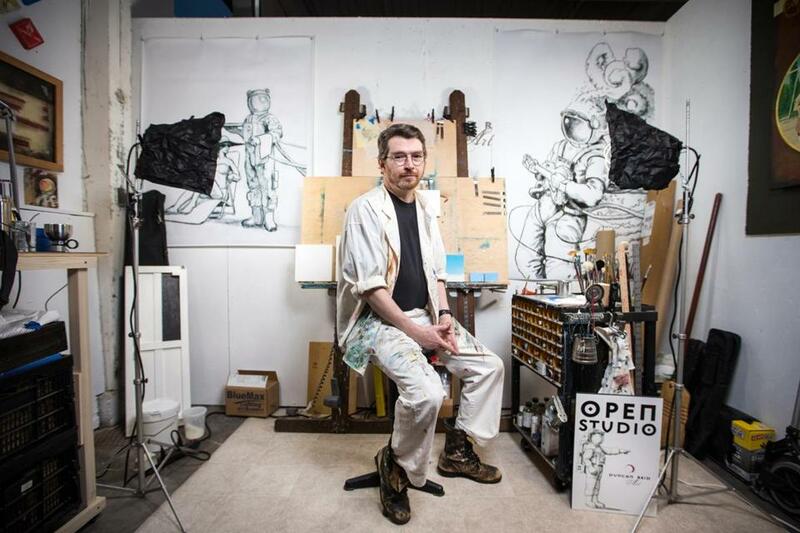 Artist Duncan Reid in his studio. 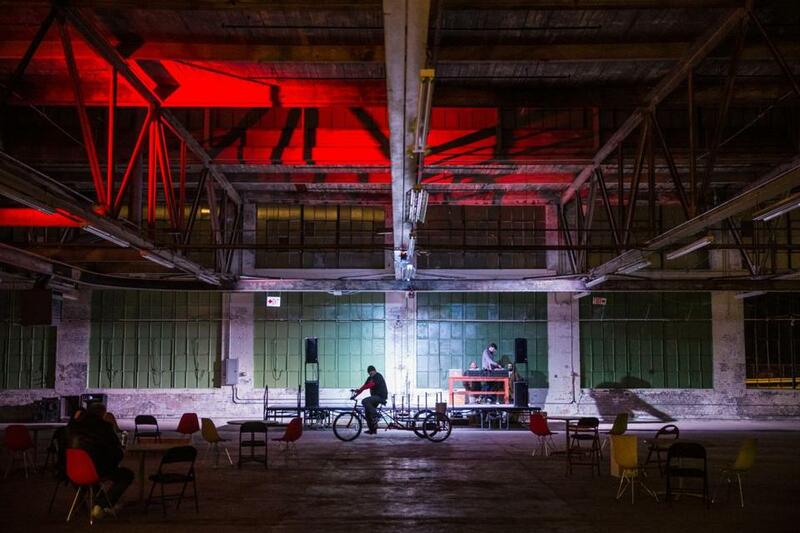 The site is being filled mostly by tenants — officially known as “members” — in creative fields. James Sullivan is a frequent contributor to the Globe. Send comments to magazine@globe.com. Follow us on Twitter @BostonGlobeMag.